Let's begin with a handy recap. For nearly two months over the summer, Senate Democrats sat on Christine Blasey Ford's 36-year-old allegation against Supreme Court nominee Brett Kavanaugh, with Sen. Dianne Feinstein reportedly telling colleagues that the claim was too distant and too unverifiable to merit serious scrutiny. Dr. Ford told Democrats that she did not want to be named publicly. Kavanaugh's contentious confirmation hearings came and went, over which period Democrats scored no points with their posturing and demagoguery (most of the Judiciary Committee Democrats announced their opposition to Kavanaugh within minutes of him being named, with some seeking to accrue extra style points for shrillness and hysteria). At no time in any meetings with Kavanaugh did any Democrat ask about the high school-era accusation, nor did the subject come up at any stage of the public or private hearings. None of the traditional committee protocols for investigating a nominee were ever set into motion. With a vote looming, the Democrats leaked Ford's allegation, against her explicit wishes. A deranged circus ensued, during which Feinstein and her colleagues (when they weren't actively validating utterly outrageous, baseless, and ultimately discredited smears) demanded delays, new hearings, and an FBI investigation. They ended up getting all three. After a handful of Republicans assented to the controversial request that the Bureau reopen its background check probe into Kavanaugh, GOP leaders had little choice but to agree. Federal agents spoke to the alleged fact witnesses named by the two most credible (which is not to say credible) Kavanaugh accusers, filing a report with those interviews. This resulted in absolutely zero new evidence or testimony that could corroborate either story -- neither of which could be backed up by any of the accusers' own named witnesses. Indeed, the only new information the FBI appeared to turn up was apparent improper pressure applied against one of the fact witnesses by Ford's allies. Angry that their FBI gambit had failed to achieve its intended partisan outcome, Democrats pivoted on a dime to claiming that the Bureau didn't do its job properly, or was even complicit in a "cover up." How quickly they shifted from hailing the FBI as the indispensable gold standard of fact-finding legitimacy, to casting aspersions on the FBI as incompetent or corrupt. All of this from the same partisans who've spent the better part of two years wringing their hands about President Trump's erosion of public confidence in American institutions via self-serving political attacks. It seems assailing and impugning institutions is just fine, so long as it's done for the "right" cause -- for instance, in a final spasm of cynicism and desperation to derail the confirmation of a conservative justice. 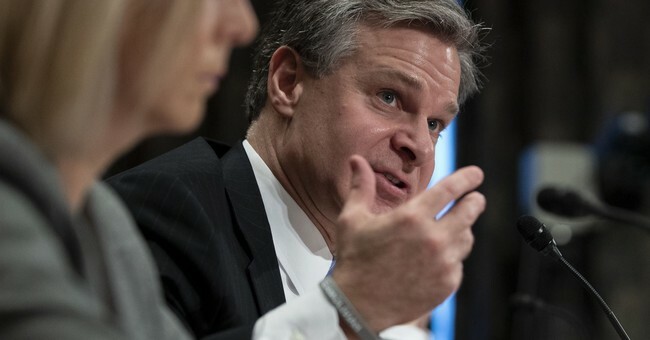 FBI Director Christopher Wray told the Senate on Wednesday that the White House put limits on the re-opened investigation into Supreme Court nominee Brett Kavanaugh, but the law enforcement chief insisted that the process used was a typical one. "Our supplemental update to the previous background investigation was limited in scope and that ... is consistent with the standard process for such investigations going back a long ways," Wray said under questioning by Sen. Kamala Harris (D-Calif.) at a Senate Homeland Security Committee hearing on global security threats..."I've spoken with our background investigation specialists and they have assured me this was handled in a way consistent with their experience and the standard process," the FBI director said, later adding that the inquiry was "very specific in scope—limited in scope."